What is the Value of Pinterest to the Travel Industry? I’ve been collecting questions from Pinterest users at every opportunity I get for a while now, as I believe this is the best way to write content for you that is most helpful to the Pinterest success of your business. Thank you for sending in any questions you might still have, they really help me to show where help is needed and I’m happy to give advice where I can! What is the value of Pinterest to the travel industry? I suppose that is very vague and open ended, but I would want to know what is the real point of doing Pinterest. Does Pinterest actively influence people to book a holiday? Such a great question! Thanks for sending it in. Let’s get right to the bottom of this. Tourism marketing has always been highly visual and that comes in handy when using image-heavy platforms such as Pinterest. Visual content makes dreams tangible: you can almost see yourself in a destination, taking in the landmarks, dining at restaurants, experiencing the local attractions -all those things that will end up on a customer’s travel itinerary. But how is Pinterest different than other visual platforms like Instagram or Snapchat? We’ll get back to that in a second. Consumers are getting more and more in charge of their own buying process. While we used to work with a booking funnel, we usually speak of a booking cycle these days, because with the rise of social media the research and booking phase have become just a fraction of the entire customer journey. In the dreaming stage, the consumer puts a destination in their consideration set. The dream is what starts the potential customer through the buying cycle. The dreaming phase pre-social media was hidden from our view, but Pinterest changes that completely. Now, we can literally see when a consumer has added your destination (via a pin) to their consideration set (one of their boards). ACTION STEP: Start by creating content that is inspirational to consumers: visual images that bring up emotions, show unique events in your destination that people might not have heard of and focus on the ‘bucket list’ type of experiences. ACTION STEP: Find users such as the person below and reach out to them through a message or comment, for example by sending them a pin of your walking tour and letting them know that perhaps your activity would be fun for them on their next visit. You could even give them a special ‘Pinterest discount code’ to book! When the consumer is ready to book, they will go back to pins that they saved to click through to websites that provide them with more specific information and the option to book. Trust is an important factor for people to book, so make sure you’ve got your website ready for them with clear navigation, simple booking options and testimonials from previous customers. Because Pinterest is set up as a search engine, users come to the platform while they are in discovery mode: they are looking for inspiration on things to make, do and/or buy. The number of searches has actually grown by 81% in 2015! Now compare that to one of my pins on Christmas markets in London. For over 3 years I’ve seen traffic spikes on my website (see below) from people that found that pin and are planning their visits to England in winter. It took me less than 5 minutes to create that pin, upload it and link it to my website. That’s the value of Pinterest for tourism right there! Want people to find your tours or other travel products? 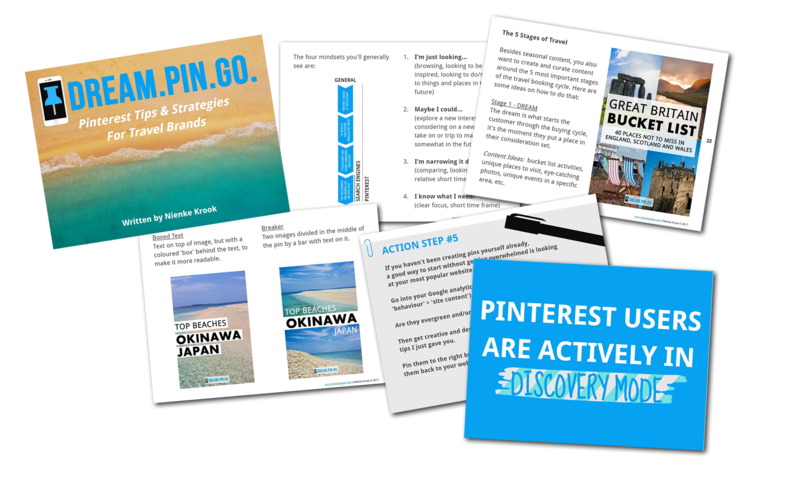 Why not upload your brochures to Pinterest and link them to a page where people can book? They already have the perfect dimension! I believe that the real power of Pinterest lies in the fact that pins have such a long lifespan, plus that unlike any other social platform, search plays an important role in how users find your content. Especially in travel, where the buying process is so much slower than when it comes to lifestyle products, this both is a huge benefit. When you optimise your content well, you can drive traffic to your website and products for years to come, reaching new audiences with little to no effort after the fact. Remember that a sale comes via a click to your website and that click comes from a pin with an eye-catching image and a clear call to action that got the attention of a consumer ‘just browsing’ in the dreaming stage. Because users have the option to bookmark your content in just a click into self-organised pin boards, it’s very easy for them to find and come back to your content when they are ready to book, only for the pin to travel on to the next user in the dreaming stage, from where the process starts again. I hope you found this answer useful. If you haven’t done so already, I can recommend watching my free webinar “Guiding Consumers Through the 5 Stages of Travel on Pinterest” on Trekksoft, which is chock-full of reasons why travel brands should be on Pinterest + practical tips to get the most out of the platform for your business. Posted in tourism marketing, travel marketingBookmark the permalink.